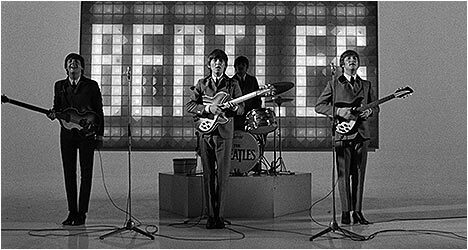 When A Hard Day’s Night (1964) was released in theaters, the Beatles had already performed on The Ed Sullivan Show and conquered America with their insanely catchy songs. Richard Lester’s irreverent film cemented their reputation as the most popular band on the planet. John, Paul, George and Ringo were fans of Lester’s work on the seminal television program The Goon Show and his short film, The Running Jumping and Standing Still Film (1959), which had the kind of oddball sense of humor the Beatles admired. Most of A Hard Day’s Night came out of Lester’s observations of the Fab Four as they portray goofier versions of themselves in what would be a subversive pisstake of the movie musical. The film starts with the title song blasting over the soundtrack as the Beatles run from legions of their screaming fans. This sequence sets an energetic tone right from the get-go and is also a fantastic snapshot of how crazy Beatlemania was at the time. The Beatles play cheeky young upstarts that delight in taking the piss out of themselves and, more importantly, out of authority figures while macking on cute girls. Everything is a goof to them, which gives the film a light touch that is fun to watch. The band was given the freedom to act and say what they pleased and the result is a lighthearted snapshot of where the band was at that time. Naturally, the film’s best bits are the musical numbers as the Beatles mime to their iconic hits. For example, they play “I Should Have Known Better” in the baggage car of a speeding commuter train to a private audience of a handful of adoring fans. Lester’s restless camera brilliantly captures the chaos that surrounded the eye of the storm that was the Fab Four. The hand-held camerawork gives A Hard Day’s Night a certain cinema verite look, which is in sharp contrast to the obvious artificiality of the film itself. Lester captures the infectious energy of their music and it can’t be stated enough just how prescient this film was on music videos. It essentially paved the way for the medium. This Blu-Ray transfer, approved by director Lester, is simply stunning as the film has never looked or, more importantly, sounded better. The sound options should make purists happy and quite simply the songs sound even better than they do on the reissued CDs! There is an audio commentary with an impressive collection of key cast and crew members that provide a wealth of filming anecdotes, including unscripted bits of business in the film. Not surprisingly, the crew talk about the technical details, like what kind of cameras were used, lighting, and so on, while the actors talk about what it was like to be around the Beatles. “In Their Own Voices” features audio excerpts from interviews the Fab Four did in promoting the film at the time it came out over behind the scenes footage and stills. They talk about their intentions, the music and so on. It is fascinating to hear their thoughts on the film. “Anatomy of a Style” features story editor and screenwriter Bobbie O’Steen and music editor Suzana Poric as they analyze five of the film’s musical sequences. They talk about how the editing captured the emotion of the music and just how groundbreaking the style of the film was at the time. Also included are two re-release trailers for the film. “You Can’t Do That: The Making of A Hard Day’s Night” is an hour-long 1994 retrospective documentary hosted by musician (and one of the film’s extras) Phil Collins. Pundits like Roger Ebert and fellow musicians like Roger McGuinn heap praise on the film while key crew members reminisce about working on it. This doc. takes us through how it came about, was made and how it changed popular culture forever. “Things They Said Today” is a 36-minute 2002 documentary that features interviews with key crew members including Richard Lester. This is more of a nuts and bolts look at how the film came together. “The Running Jumping and Standing Still Film” is live-action short film that Lester shot in 1959 with Spike Milligan and Peter Sellers. It was a favorite of the Beatles and instrumental in them picking him to direct A Hard Day’s Night. It too has a loose, improvisational look and feel. “Picturewise” is a featurette on Lester’s early work and how it led to A Hard Day’s Night. It goes through how the techniques he learned on those early films prepared him for working with the Beatles. Finally, there is “The Beatles: The Road to A Hard Day’s Night,” which features Beatles author Mark Lewisohn talking about the band’s career up to the film. He discusses how growing up in Liverpool shaped their music, and their early years playing small nightclubs, paying their dues as musicians.